The development works in the Ca N’Alemany business park in Viladecans, executed by the joint venture RUBAU-ACSA-AQUALOGY, won the award for best waterworks in an urban environment at the first edition of the Best Waterworks Awards organised by the International water and irrigation trade fair, SMAGUA 2017, one of the most prestigious in the sector. The project, with a budget of over 37 million euros, consisted of the development of the Ca N’Alemany business park in Viladecans, covering 54 ha that had not yet been developed despite its great technological and commercial potential, located just ten minutes away from the city of Barcelona. The works consisted of demolitions, earth movement, layers of asphalt surfacing and granular sub-layers, drainage, utilities networks (medium and low voltage, gas, potable and non-potable water, lighting, communications, etc. ), reinforced concrete and metal structures, reinforced earth and gabion walls, road safety elements and signposting. The specific features of the development, apart from the roads themselves, include the channelling and naturalisation of a stream, the flood abatement system with the realization of a large landscaped central pool and its associated pumping system and the redevelopment of an old local road which has become a four-lane avenue with central reservation and pavements. The environmental sustainability of Ca N’Alemany is one of the highlights of the project. The criteria applied were the reduction of the impact on the surrounding area caused by the incorporation of a new urban drainage basin, the use of groundwater and the reuse of reclaimed water from the Gavá-Viladecans wastewater treatment plant (WWTP) for irrigation of the park and the Viladecans municipal area. A dual potable and non-potable execution network and a dual waste- and rainwater sewerage network. These networks have special infrastructures and installations that make Ca N’Alemany business park an example of comprehensive improvement of the water cycle. One of the highlights is the building of a large hydraulic infrastructure consisting of a system of six green flood abatement ditches, connected to each other, to collect rainwater and a 90,000-cubic-metre flood abatement pool with three zones at a lower phreatic level to guarantee the presence of a permanent sheet of standing water. As well as absorbing the waters of the Sant Llorenç stream in the event of a flood, this pool collects the waters from the ditches, the rainwater drains and those from the roads drained by means of a natural purification system. Thanks to the purpose-built pumping station, it can be emptied in just 48 hours. The SMAGUA jury, chaired by the president of the Spanish Committee on Large Dams – SPANCOLD and vice president of the Spanish Society of Civil Engineers, José Polimón, and which includes a number of personalities from the world of waterworks and engineering, praised the environmental sustainability of all the work carried out by the joint venture RUBAU-ACSA-AQUALOGY in Ca N’Alemany in relation to the water cycle, tackled with a comprehensive, systematic approach. It also highlighted the increase in green spaces including the indigenous wetland vegetation and the creation of environments of high landscape quality. 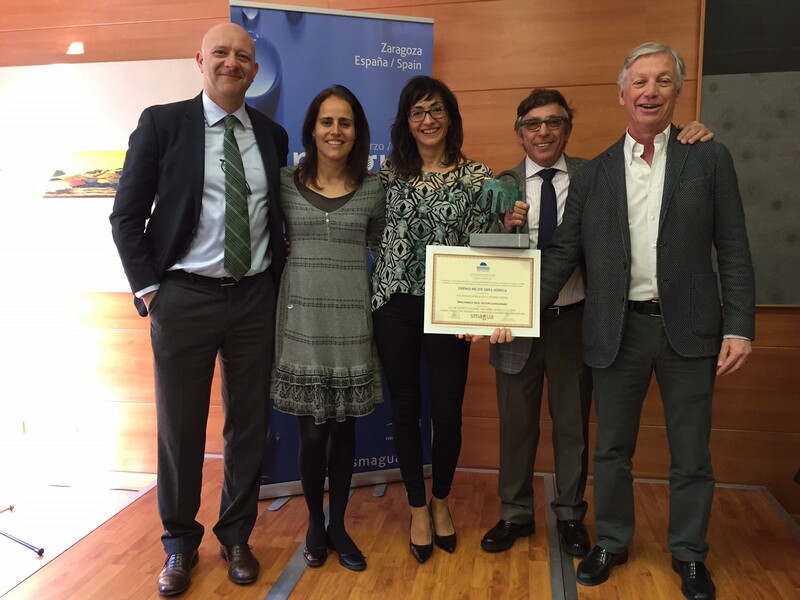 It is for all these reasons that Ca N’Alemany, one of the business parks in the Barcelona metropolitan area with the highest development potential, received the award for the best waterworks in an urban environment.